The most beloved place to visit in Rome, this unique Vatican tour includes the Vatican Museums and Sistine Chapel. 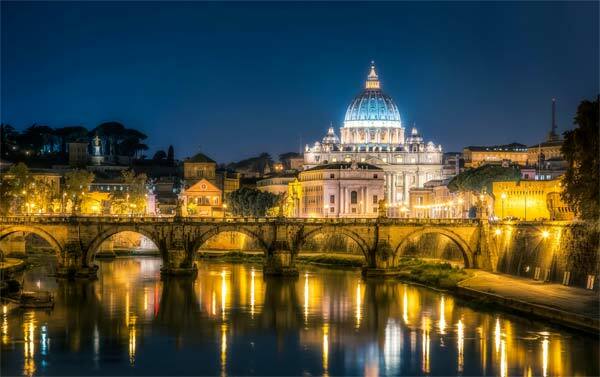 All must-see destinations when visiting Vatican City - now beautifully illuminated by night and without the crowds. This fabulous tour is specially designed with wheelchair users in mind. 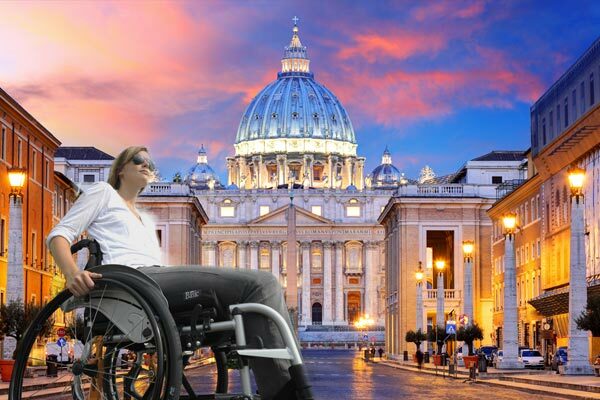 Our guide takes you through the most important parts of the Vatican Museums that have wheelchair accessibility - the Pinacoteca Gallery, the Chiaramonti Museum and the Sistine Chapel. This private tour is a truly unique experience, as you explore the amazing sights with a small group. And you can skip the line, allowing you more time to enjoy your Vatican visit. The 3rd century is known as the “troubled century” in Roman history as it saw a steady decline in Imperial power and the threat of the so-called ‘Barbarians’ - the non-Roman tribes at the far reaches of the Empire. This threat became such that in 271 A.D. work began under the Emperor Aurelian on the building of walls around the city. For the first time in 500 years, the city needed fortification and the hurried building of the Aurelian Walls over the next four years was a sign that things were taking a definite turn for the worse. Less than fifty years after the walls had been built, another major event took place; in the year 313 the Emperor Constantine made Christianity one of the legitimate religions of state. Whether or not he did this following conversion is uncertain; undoubtedly he sought to appease the, by now very significant, part of the Empire which followed an illegal religion which refused to acknowledge the divine role of the Emperor. Such had been the spread of Christianity that even the Emperor’s mother, St. Helena, was a convert and her role in its decriminalization was undoubtedly significant. Once he had legitimized Christianity, Constantine set about building places of worship for the Christians. The first church he built was dedicated to the Savior, subsequently rededicated to Saints John the Baptist and Evangelist and was built on land just within the city walls on land which had belonged to the Lateran family. As the first official church built in the city, St. John in Lateran still today houses the throne of the Bishop of Rome (one of the Pope’s many titles), and holds the title Mother Church of All of the Catholic World. Some ten years after the Lateran Basilica had been constructed, work began on another. Built over the tomb of St. Peter, prince of the Apostles, the Basilica of St. Peter in the Vatican was consecrated in 326 A.D. The reign of Constantine is a fundamental moment in the Christianizing of the city. A city within a city and a country within a country, the world’s smallest sovereign state houses the world’s largest church, and one of its largest museums. 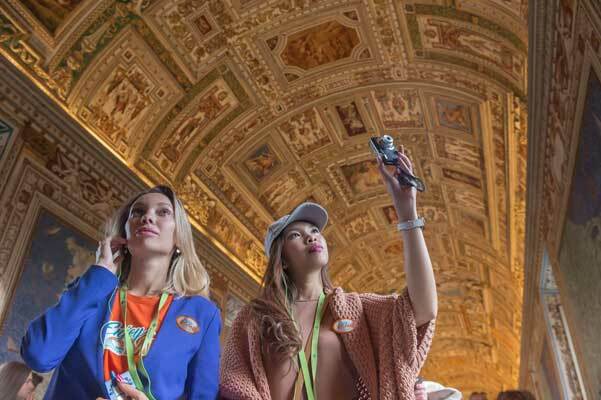 Enjoy Rome’s 3-hour “Vatican City” walking tour covers highlights of the Museums, including the Octagonal Courtyard, the Gallery of the Maps, the Sistine Chapel, and St. Peter’s Basilica. Built over the tomb of St. Peter by Constantine in the early 4th century, the Basilica stood for almost 1200 years. But after a millennium of violence which characterized the Middle Ages, centuries which saw an absence of maintenance and destruction by various invaders, the deterioration of the vast structure was inevitable. Plans to restore the Basilica began under Nicholas V in the mid 15th century, but the dramatic decision to demolish the Basilica absolutely and replace it with a new one was taken following the election of the fearsome and dynamic Pope Julius II in 1503. The project which followed took 120 years, cost more money than anyone had ever imagined, and was indirectly one of the catalysts which sparked the Protestant Reformation. In the first chapel on the right-hand side as you enter is the Pietà. Carved by Michelangelo from a single block of marble, it was intended to decorate the tomb of Cardinal Jean de Bilhéres. The piece, completed when Michelangelo was just 24 years old, marks the beginning of his career as a major sculptor. Under the vast dome of the church is the High Altar, which lies on top of what is believed to be the tomb of St. Peter's and where the Pope still holds mass. On top of the Altar lies the spectacular St. Peter's Baldachin, a large Baroque sculpted bronze canopy designed by the understated genius Gian Lorenzo Bernini. Also by Bernini is the Glory of Saint Peter, the mass of gilded wood and stucco work which explodes from around the oval window bearing the dove, representation of the Holy Spirit. Beneath is the symbolic throne of the Popes, cast in bronze to encase a wooden throne known as the Throne of St. Peter. When Bernini died at the age of 82, he was working on the tomb of Alexander VII, just beyond the left transept. Completed by Bernini’s workshop, it is a fabulous theatrical solution to the problematic spot over the service corridor. Bernini clad the doorway in black marble, from which a gilded skeleton emerges. Representing Death, the skeleton clasps an hour-glass, a reminder of the constant passing of time, and is enveloped by a cloak of carved Sicilian marble above which kneels the figure of Alexander VII, triumphant in prayer and victorious over death. Inside the Basilica, by the left transept, is the entrance to the Treasury Museum (9am-5:15pm daily, €6) which contains lots of glittering crosses and chalices, as well as the fabulous bronze tomb of Pope Sixtus IV, the man who built the Sistine Chapel. To the right of the gate into the Basilica itself is: a smaller gate that leads to a souvenir shop (the place for the most authentic Vatican rosaries), the entrance to the crypt of the church (site of the tombs of many popes, including John Paul II), and if you would like to climb to the top of the dome follow the signs reading ‘Cupola‘ (8am-5pm daily, €7 with elevator part way, €5 without). Past the Swiss Guard (Vatican Army) and at the bottom of the steps on the right as you leave the Basilica is the entrance to the Ufficio Scavi (Excavations office). Here, highly recommended tours organized by the Vatican lead down into the Necropolis underneath the Basilica, into the area where St. Peter is believed to have been buried. Reservations are limited and bookings should be made well in advance through scavi@fsp.va. If you don’t have reservations and find yourself in town don’t bother sending an email, you’ll never get a reply in time. However it is sometimes worth dropping in at the Excavations office on the off chance- persistence and flexibility can sometimes pay off. If you would like to attend Mass in St. Peter’s, daily services are held at 12 noon- usually in the left transept, and at 4.45pm- usually at the altar at the end of the choir, under the Glory of St. Peter. Papal Masses require free tickets, which along with tickets for the Papal General Audience (every Wednesday at 10.30am) can be obtained through the Prefettura della Casa Pontificia. The office is open Mon-Sat 9am-1.30pm, reservations for tickets can be made by calling (+39) 06 69883114, or sending a fax to (+39) 06 69885863. Once the incredibly long project of building the Basilica had been completed, attention was turned to the piazza in front of it. It was the ever prolific star of Roman art of the 17th century, Gian Lorenzo Bernini, who was brought in to create the spectacular space which would welcome pilgrims into the new Basilica. Its colonnades forming the embracing arms of the Church have at the centre, the Egyptian obelisk which once stood in the nearby Circus of the Emperor Nero, and which is believed to have witnessed the crucifixion of St. Peter. One of the largest and most visited museums in the world, the Vatican Museums are a patchwork of existing areas of the Papal palaces (such as the Gallery of the Maps, and the Raphael Rooms – once the apartments of Julius II), and areas purpose-built as museum spaces from the late 18th century onwards. It is home to the world’s largest archaeological collection, including the spectacular Hellenistic sculpture of the Laocoon in the Octagonal Courtyard. However, undoubtedly the majority of the 4 million people who flood through the doors every year are here to see the Sistine Chapel. Still today the private chapel of the Pope and the College of Cardinals, and the place of the elections of the Popes, the Sistine Chapel contains paintings by the great Florentine and Umbrian masters of the late 15th century; Botticelli, Perugino, Ghirlandaio and company. Most celebrated, however, is the vast ceiling painted by Michelangelo. An ingenious illusionistic architectural framework was painted to house scenes from the Book of Genesis, prophets, and the ancestors of Christ. Each plays their part in an elaborate theme which speaks of redemption and salvation, and which was to set the model for ceiling painting for several centuries.